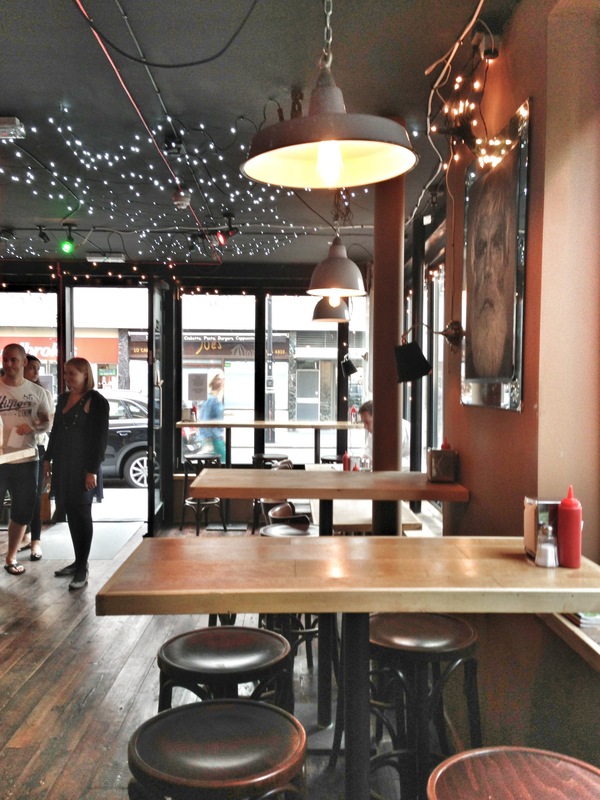 Home » ★★★☆☆ » Tommi’s Burger Joint. Plain, lovely. 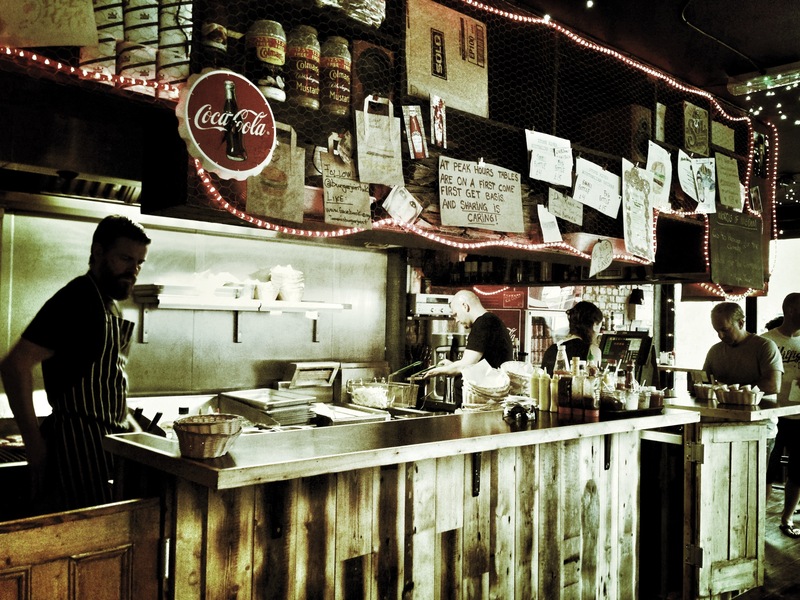 Tommi’s Burger Joint. Plain, lovely. For many years, this spot was occupied by a Greek restaurant, which last had a customer in 1969. I used to work opposite and never saw anyone enter or leave, other than the ancient Cypriot waiters for whom it was clearly a second home. Either that or it had to be a front for some sort of dodgy operation. Whatever it was, the inexorable march of the modernisers at the Howard de Walden Estate meant that its days were numbered. 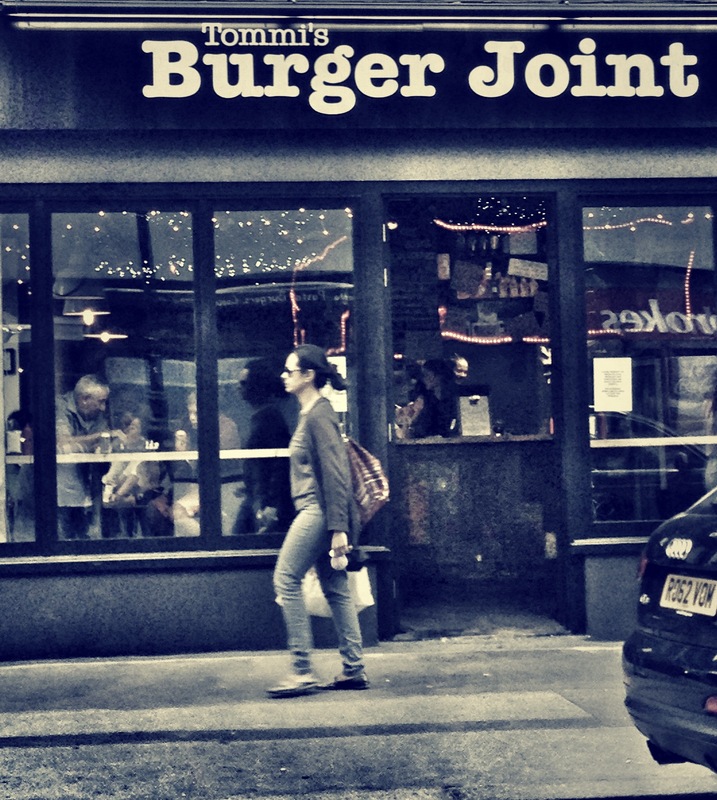 It’s now the northernmost point of the Burger Triangle, with Patty & Bun and MeatLiquor just a mere stroll away. All very good. All very different. Last time I came here the queue was snaking down the road. I gave up after ten minutes, given that there was no visible sign of movement and C was sporting the face, wanting to go to Meatliquor, his new burger joint of choice. He’s late to these things, is C, but since forcing him to try MeatLiquor (he doesn’t do new) he has become an avid fan, At pushing 60, he’s down with the kids. As if. I think I saw him take my special British Sleep and Snoring Society earplugs last time he visited and pretend to be deaf. He’s really much more Mozart than Mötorhead. I had thought that size of the queue here was in direct proportion to burger quality. It is. But there’s another reason. The burgers are slow to arrive. This is fast food in name only. You wait whilst everything is cooked to order. There was no queue when we went, but it still took 15 minutes. Tommi’s is the brainchild of Icelandic entrepreneur Tómas Tomasson. I have no idea who he is. I’m sure he’s a legend in Reykjavik. There were quite a lot of people in there talking very loudly in a language I couldn’t identify. Probably Icelandic then, at a guess. I could hear myself speak. But it was 5.30 and they hadn’t turned the music up in deference to the oldies. And (other than C ) there was, indeed another person of age. The Lord be thanked. And they had every condiment known to man. I was impressed. 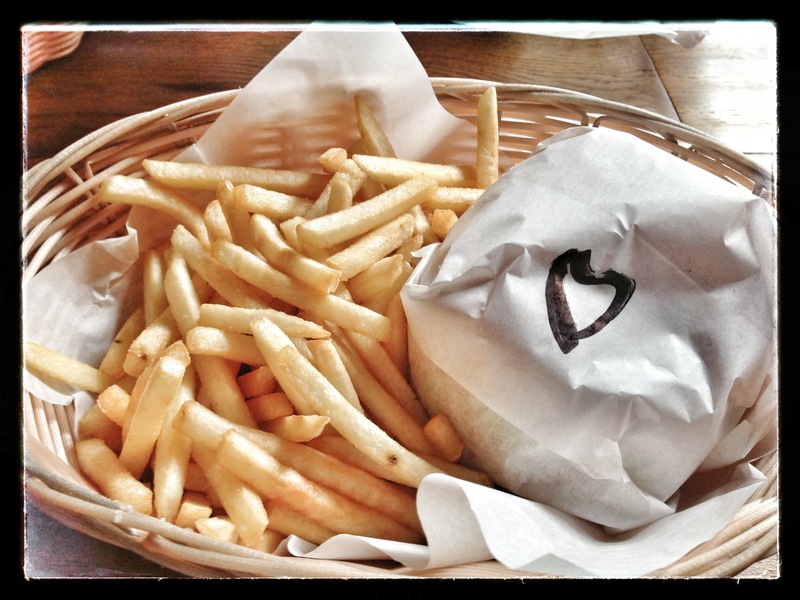 And the burger was – bugger you Westminster and your food safety requirements – rare in the middle. Yay. It’s more basic than its near neighbours; more plain vanilla, in terms of variety or original burger toppings and the like. It’s just plain and simple. Burger, cheeseburger, veggieburger and steak burger. That’s the sum of it. And it’s a good deal at £9.50 for the burger, soda (for which read ‘a selection of soft drinks’) and fries. I got that slightly claggy white bread thing on the roof of my mouth, but I suspect that was more to do with the enormous amount of mustard and tomato relish I put on the burger, than anything actually wrong with the bun. The meat was good and properly charred. Good flavour. Skinny chips were crispy not oily. They were soggy after I’d drenched them with industrial amounts of Sarsons. I’m not complaining, I’m just saying. One duff note. The loos. Painted in a unflattering brown, as if to remind you of what actually goes on there. A crap colour, frankly. Added to that, a harsh, nasty centre light, that makes you look like an extra from Shaun of the Dead. This is a room which transports you straight to the gloom of an Icelandic winter. And it looks grubby. Sort it out please. 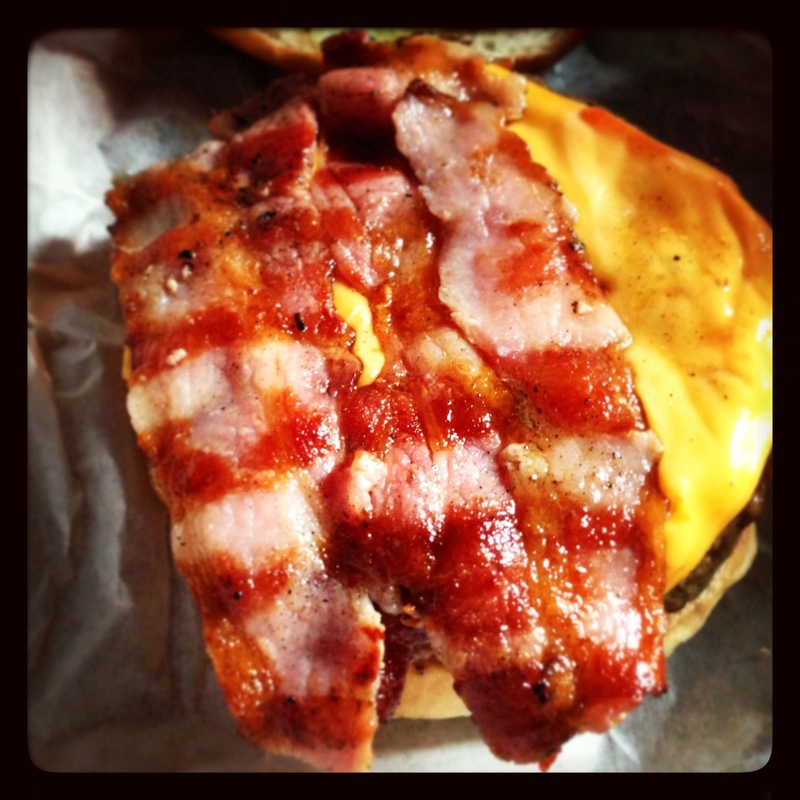 Bacon, cheese, bun, meat. It’s all good. Check out the 70’s vibe. Man. It’s an improvement on the Greek.